A research team has demonstrated the effectiveness of a 3-antibiotic cocktail that kills methicillin-resistant Staphylococcus aureus, or MRSA, in all mice that were treated with it. Scanning electron micrograph of a human neutrophil ingesting MRSA. Image via Wikipedia. 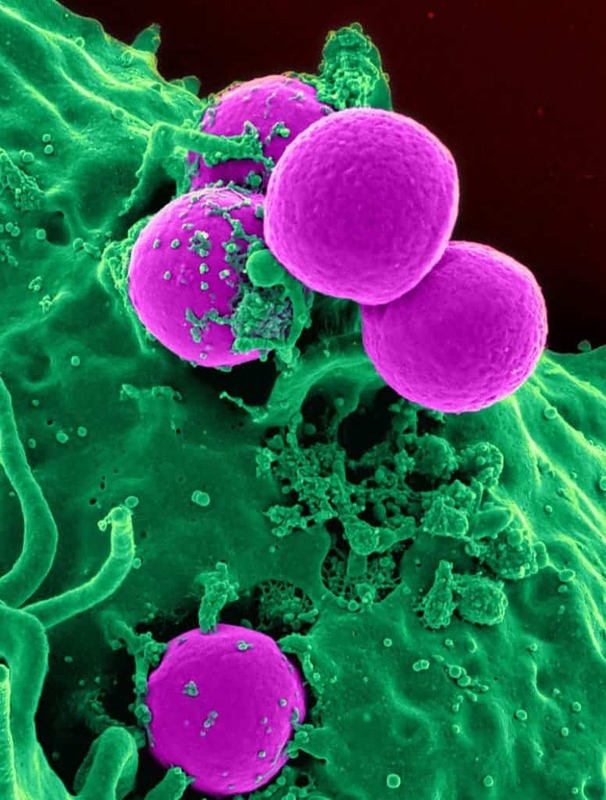 MRSA is a bacterium responsible for several difficult-to-treat infections in humans. MRSA is especially threatening in hospitals, prisons and nursing homes, where patients with open wounds or invasive devices generally have weakened immune systems and are at a much greater risk of infection. The research team has been working with antibiotics that are ineffective against specific pathogens that have evolved to resist them; the three antibiotics they used are meropenem, piperacillin and tazobactam, although practically, they can be considered two drugs, since piperacillin and tazobactam together make up Zosyn. Although these antibiotics are strong injectables, they have no effect on MRSA individually – but together, they work. They tested the drug combination on 73 different strains of the MRSA microbe, and it worked against all of them, curing the infection. There was also no indication that the bacterium was developing resistance to the drugs. The results were so promising that the team are looking to test the cocktail in humans as soon as possible. The study is published in Nature: Chemical Biology.